Want to ensure that your voice is heard as the build-up continues to WRC-19? Want to generate exciting new business relationships or leads? 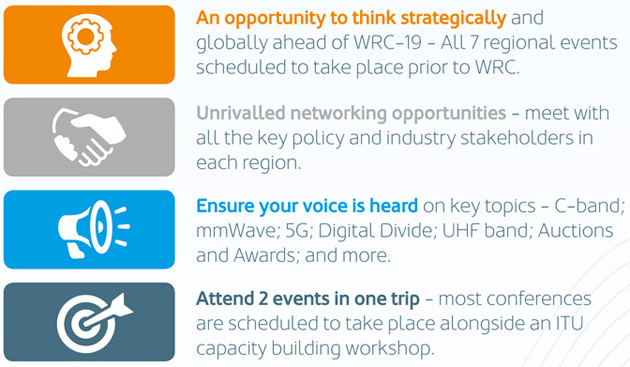 As the number one meeting point for the spectrum community in the region, the European Spectrum Management Conference is the ideal platform for you. Click here to download the sponsorship brochure for this event, or read on to find out more about the benefits of becoming a part of The Global Spectrum Series - The meeting place for the global spectrum community. The Global Spectrum Series is the world'slargest and most comprehensive collection of Spectrum Management policy conferences, with sector-leading regional events taking place annually in Europe, Latin America, The Americas, CIS & Central Eastern Europe, Middle East & North Africa and Asia-Pacific. Each event is established as a key platform within the specific region, providing attendees with the highest quality content and networking opportunities. With delegate numbers typically ranging between 150-300 participants, each event brings together leading regional policy and business related spectrum experts, with key global experts from around the world. The Global Spectrum Series is unique in offering the global spectrum community a high level platform to discuss key issues, opportunities to network, develop new contacts and exchange best practices both within and beyond regional boundaries. Why be involved in a Global Spectrum Series event? Who attends Global Spectrum Series events? For more information on sponsorship or exhibiting please download the sponsorship brochure here or contact Jordan Francombe at spectrum-management@forum-europe.com or on +44 (0) 2920 783 074.